South Asia or Southern Asia, is a term used to represent the southern region of the Asian continent, which comprises the sub-Himalayan SAARC countries and, for some authorities, adjoining countries to the west and east. Topographically, it is dominated by the Indian Plate, which rises above sea level as Nepal and northern parts of India situated south of the Himalayas and the Hindu Kush. South Asia is bounded on the south by the Indian Ocean and on land (clockwise, from west) by West Asia, Central Asia, East Asia, and Southeast Asia. Indo-Aryan, Dravidian, Sino-Tibetan, Austroasiatic, Iranian, etc. The current territories of Afghanistan, Bangladesh, Bhutan, Maldives, Nepal, India, Pakistan, and Sri Lanka form South Asia. The South Asian Association for Regional Cooperation (SAARC) is an economic cooperation organisation in the region which was established in 1985 and includes all eight nations comprising South Asia. South Asia covers about 5.2 million km2 (2 million mi2), which is 11.71% of the Asian continent or 3.5% of the world's land surface area. The population of South Asia is about 1.891 billion or about one fourth of the world's population, making it both the most populous and the most densely populated geographical region in the world. Overall, it accounts for about 39.49% of Asia's population, over 24% of the world's population, and is home to a vast array of people. In 2010, South Asia had the world's largest population of Hindus, Jains and Sikhs. It also has the largest population of Muslims in the Asia-Pacific region, as well as over 35 million Christians and 25 million Buddhists. The total area of South Asia and its geographical extent is not clear cut as systemic and foreign policy orientations of its constituents are quite asymmetrical. Aside from the central region of South Asia, formerly part of the British Empire, there is a high degree of variation as to which other countries are included in South Asia. Modern definitions of South Asia are consistent in including Afghanistan, India, Pakistan, Bangladesh, Sri Lanka, Nepal, Bhutan and Maldives as the constituent countries. Myanmar is included by some scholars in South Asia, but in Southeast Asia by others. Some do not include Afghanistan, others question whether Afghanistan should be considered a part of South Asia or the Middle East. The current territories of Bangladesh, India, and Pakistan, which were the core of the British Empire from 1857 to 1947, form the central region of South Asia, in addition to Afghanistan, which was a British protectorate until 1919, after the Afghans lost to the British in the Second Anglo-Afghan war. The mountain countries of Nepal and Bhutan, and the island countries of Sri Lanka and Maldives are generally included as well. Myanmar (formerly Burma) is often added, and by various deviating definitions based on often substantially different reasons, the British Indian Ocean Territory and the Tibet Autonomous Region are included as well. The South Asian Association for Regional Cooperation (SAARC), a contiguous block of countries, started in 1985 with seven countries – Bangladesh, Bhutan, India, the Maldives, Nepal, Pakistan and Sri Lanka – and added Afghanistan as an eighth member in 2007. China and Myanmar have also applied for the status of full members of SAARC. This bloc of countries include two independent countries that were not part of the British Raj – Nepal, and Bhutan. Afghanistan was a British protectorate from 1878 until 1919, after the Afghans lost to the British in the Second Anglo-Afghan war. The World Factbook, based on geo-politics, people, and economy defines South Asia as comprising Afghanistan, Bangladesh, Bhutan, British Indian Ocean Territory, India, Maldives, Nepal, Pakistan, and Sri Lanka. The South Asia Free Trade Agreement incorporated Afghanistan in 2011, and the World Bank grouping of countries in the region also includes all eight members comprising South Asia and SAARC as well, and the same goes for the United Nations Children's Fund (UNICEF). When the Centre for South Asian Studies at the University of Cambridge was established, in 1964, it promoted the study of India, Pakistan, Sri Lanka, Bangladesh, Afghanistan, the Himalayan Kingdoms (Nepal, Bhutan, and Sikkim), and Burma (now Myanmar). It has since included Thailand, Malaysia, Singapore, Vietnam, Cambodia, Laos, Indonesia, the Philippines and Hong Kong. The Centres for South Asian Studies at both the University of Michigan and the University of Virginia include Tibet along with the eight members of SAARC in their research programs, but exclude the Maldives. The South Asian Studies Program of Rutgers University and the University of California, Berkeley Centre for South Asia Studies also include the Maldives. The South Asian Studies Program of Brandeis University defines the region as comprising "India, Pakistan, Bangladesh, Sri Lanka, Nepal, Bhutan, and in certain contexts Afghanistan, Burma, Maldives and Tibet". The similar program of Columbia University includes Afghanistan, Bangladesh, India, the Maldives, Nepal, Pakistan, and Sri Lanka in their study and excludes Burma. The United Nations Statistics Division's scheme of sub-regions include all eight members of the SAARC as part of Southern Asia, along with Iran only for statistical purposes. Population Information Network (POPIN) includes Afghanistan, Bangladesh, Burma, India, Nepal, Pakistan and Sri Lanka as part of South Asia. Maldives, in view of its characteristics, was admitted as a member Pacific POPIN subregional network only in principle. The Hirschman–Herfindahl index of the United Nations Economic and Social Commission for Asia and the Pacific for the region includes only the original seven signatories of SAARC. The British Indian Ocean Territory is connected to the region by a publication of Jane's for security considerations. The region may also include the disputed territory of Aksai Chin, which was part of the British Indian princely state of Jammu and Kashmir, but is now administered as part of the Chinese autonomous region of Xinjiang. The inclusion of Myanmar in South Asia is without consensus, with many considering it a part of Southeast Asia and others including it within South Asia. Afghanistan was of importance to the British colonial empire, especially after the Second Anglo-Afghan War over 1878–1880. Afghanistan remained a British protectorate until 1919, when a treaty with Vladimir Lenin included the granting of independence to Afghanistan. Following India's partition, Afghanistan has generally been included in South Asia, with some considering it a part of Southwest Asia. During the Soviet–Afghan War (1979–1989) American foreign policy considered Pakistan and Afghanistan in Southwest Asia, while others included it as a part of South Asia. There is no universal agreement among scholars on which countries should be included within South Asia. In the past, a lack of a coherent definition for South Asia resulted in not only a lack of academic studies, but also in a lack interest for such studies. The confusion existed also because of the lack of a clear boundary – geographically, geopolitical, socio-culturally, economically or historically – between South Asia and other parts of Asia, especially the Middle East and Southeast Asia. Identification with a South Asian identity was also found to be significantly low among respondents in an older two-year survey across Bangladesh, India, Nepal, Pakistan, and Sri Lanka. However, modern definitions of South Asia are very consistent in including Afghanistan, India, Pakistan, Bangladesh, Sri Lanka, Nepal, Bhutan and Maldives as the constituent countries. According to the Oxford English Dictionary, the term "subcontinent" signifies a "subdivision of a continent which has a distinct geographical, political, or cultural identity" and also a "large land mass somewhat smaller than a continent". Historians Catherine Asher and Cynthia Talbot state that the term "Indian subcontinent" describes a natural physical landmass in South Asia that has been relatively isolated from the rest of Eurasia. The Indian subcontinent is also a geological term referring to the land mass that drifted northeastwards from ancient Gondwana, colliding with the Eurasian plate nearly 55 million years ago, towards the end of Palaeocene. This geological region largely includes Bangladesh, Bhutan, India, Maldives, Nepal, Pakistan and Sri Lanka. The use of the term Indian subcontinent began in the British Empire, and has been a term particularly common in its successors. This region has also been labelled as "India" (in its classical and pre-modern sense), "Greater India", or as South Asia. According to anthropologist John R. Lukacs, "the Indian Subcontinent occupies the major landmass of South Asia", while the political science professor Tatu Vanhanen states, "the seven countries of South Asia constitute geographically a compact region around the Indian Subcontinent". According to Chris Brewster, India, Pakistan, Bangladesh, Sri Lanka, Nepal and Bhutan constitute the Indian subcontinent; with Afghanistan and Maldives included it is more commonly referred to as South Asia. The geopolitical boundaries of Indian subcontinent, according to Dhavendra Kumar, include "India, Pakistan, Bangladesh, Sri Lanka, Nepal, Bhutan and other small islands of the Indian Ocean". Maldives, the country consisting of a small archipelago southwest of the peninsula, is considered part of the Indian subcontinent. The terms "Indian subcontinent" and "South Asia" are sometimes used interchangeably. The South Asia term is particularly common when scholars or officials seek to differentiate this region from East Asia. According to historians Sugata Bose and Ayesha Jalal, the Indian subcontinent has come to be known as South Asia "in more recent and neutral parlance." This "neutral" notion refers to the concerns of Pakistan and Bangladesh, particularly given the recurring conflicts between India and Pakistan, wherein the dominant placement of "India" as a prefix before the subcontinent might offend some political sentiments. There is no globally accepted definition on which countries are a part of South Asia or Indian subcontinent. While Afghanistan is not considered as a part of the Indian subcontinent, Afghanistan is often included in South Asia. Similarly, Myanmar is included by some scholars in South Asia but not in Indian subcontinent. The history of core South Asia begins with evidence of human activity of Homo sapiens, as long as 75,000 years ago, or with earlier hominids including Homo erectus from about 500,000 years ago. The Indus Valley Civilization, which spread and flourished in the northwestern part of South Asia from c. 3300 to 1300 BCE in present-day Northern India, Pakistan and Afghanistan, was the first major civilization in South Asia. A sophisticated and technologically advanced urban culture developed in the Mature Harappan period, from 2600 to 1900 BCE. The earliest prehistoric culture have roots in the mesolithic sites as evidenced by the rock paintings of Bhimbetka rock shelters dating to a period of 30,000 BCE or older,[note 2] as well as neolithic times. [note 3] According to anthropologist Possehl, the Indus Valley Civilization provides a logical, if somewhat arbitrary, starting point for South Asian religions, but these links from the Indus religion to later-day South Asian traditions are subject to scholarly dispute. The Vedic period, named after the Vedic religion of the Indo-Aryans,[note 4] lasted from c. 1900 to 500 BCE. 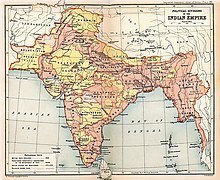 The Indo-Aryans were pastoralists who migrated into north-western India after the collapse of the Indus Valley Civilization, Linguistic and archaeological data show a cultural change after 1500 BCE, with the linguistic and religious data clearly showing links with Indo-European languages and religion. By about 1200 BCE, the Vedic culture and agrarian lifestyle was established in the northwest and northern Gangetic plain of South Asia. Rudimentary state-forms appeared, of which the Kuru-Pañcāla union was the most influential. The first recorded state-level society in South Asia existed around 1000 BCE. In this period, states Samuel, emerged the Brahmana and Aranyaka layers of Vedic texts, which merged into the earliest Upanishads. These texts began to ask the meaning of a ritual, adding increasing levels of philosophical and metaphysical speculation, or "Hindu synthesis". Increasing urbanisation of India between 800 and 400 BCE, and possibly the spread of urban diseases, contributed to the rise of ascetic movements and of new ideas which challenged the orthodox Brahmanism. These ideas led to Sramana movements, of which Mahavira (c. 549–477 BCE), proponent of Jainism, and Buddha (c. 563-483), founder of Buddhism, were the most prominent icons. The Greek army led by Alexander the Great stayed in the Hindu Kush region of South Asia for several years and then later moved into the Indus valley region. Later, the Maurya Empire extended over much of South Asia in the 3rd century BCE. Buddhism spread beyond south Asia, through northwest into Central Asia. The Bamiyan Buddhas of Afghanistan and the edicts of Aśoka suggest that the Buddhist monks spread Buddhism (Dharma) in eastern provinces of the Seleucid Empire, and possibly even farther into West Asia. The Theravada school spread south from India in the 3rd century BCE, to Sri Lanka, later to Southeast Asia. Buddhism, by the last centuries of the 1st millennium BCE, was prominent in the Himalayan region, Gandhara, Hindu Kush region and Bactria. From about 500 BCE through about 300 CE, the Vedic-Brahmanic synthesis or "Hindu synthesis" continued. Classical Hindu and Sramanic (particularly Buddhist) ideas spread within South Asia, as well outside South Asia. The Gupta Empire ruled over a large part of the region between 4th and 7th centuries, a period that saw the construction of major temples, monasteries and universities such as the Nalanda. During this era, and through the 10th century, numerous cave monasteries and temples such as the Ajanta Caves, Badami cave temples and Ellora Caves were built in South Asia. Islam came as a political power in the fringe of South Asia in 8th century CE when the Arab general Muhammad bin Qasim conquered Sindh and Multan in southern Punjab in modern-day Pakistan. By 962 CE, Hindu and Buddhist kingdoms in South Asia were under a wave of raids from Muslim armies from Central Asia. Among them was Mahmud of Ghazni, who raided and plundered kingdoms in north India from east of the Indus river to west of Yamuna river seventeen times between 997 and 1030. Mahmud of Ghazni raided the treasuries but retracted each time, only extending Islamic rule into western Punjab. The wave of raids on north Indian and western Indian kingdoms by Muslim warlords continued after Mahmud of Ghazni, plundering and looting these kingdoms. The raids did not establish or extend permanent boundaries of their Islamic kingdoms. The Ghurid Sultan Mu'izz al-Din Muhammad began a systematic war of expansion into north India in 1173. He sought to carve out a principality for himself by expanding the Islamic world. Mu'izz sought a Sunni Islamic kingdom of his own extending east of the Indus river, and he thus laid the foundation for the Muslim kingdom that became the Delhi Sultanate. Some historians chronicle the Delhi Sultanate from 1192 due to the presence and geographical claims of Mu'izz al-Din in South Asia by that time. The Delhi Sultanate covered varying parts of South Asia, and was ruled by a series of dynasties, called Mamluk, Khalji, Tughlaq, Sayyid and Lodi dynasties. Muhammad bin Tughlaq came to power in 1325, launched a war of expansion and the Delhi Sultanate reached it largest geographical reach over the South Asian region during his 26-year rule. A Sunni Sultan, Muhammad bin Tughlaq persecuted non-Muslims such as Hindus, as well as non-Sunni Muslims such as Shia and Mahdi sects. Revolts against the Delhi Sultanate sprang up in many parts of South Asia during the 14th century. After the death of Muhammad bin Tughlaq, the Bengal Sultanate came to power in 1352 CE, as the Delhi Sultanate began disintegrating. The Bengal Sultanate remained in power through the early 16th century. It was reconquered by the armies of the Mughal Empire. The state religion of the Bengal Sultanate was Islam, and the region under its rule, a region that ultimately emerged as the modern nation of Bangladesh, saw a growth of a syncretic form of Islam. In the Deccan region, the Hindu kingdom Vijayanagara Empire came to power in 1336 and remained in power through the 16th century, after which it too was reconquered and absorbed into the Mughal Empire. About 1526, the Punjab governor Dawlat Khan Lodī reached out to the Mughal Babur and invited him to attack Delhi Sultanate. Babur defeated and killed Ibrahim Lodi in the Battle of Panipat in 1526. The death of Ibrahim Lodi ended the Delhi Sultanate, and the Mughal Empire replaced it. The modern history period of South Asia, that is 16th-century onwards, witnessed the start of the Central Asian dynasty named the Mughals, with Turkish-Mongol roots and Sunni Islam theology. The first ruler was Babur, whose empire extended the northwest and Indo-Gangetic Plain regions of South Asia. The Deccan and northeastern region of the South Asia was largely under Hindu kings such as those of Vijayanagara Empire and Ahom kingdom, with some regions such as parts of modern Telangana and Andhra Pradesh under local Sultanates such as the Shia Islamic rulers of Golconda Sultanate. British Indian Empire in 1909. British India is shaded pink, the princely states yellow. The Mughal Empire continued its wars of expansion after Babur's death. With the fall of the Rajput kingdoms and Vijayanagara, its boundaries encompassed almost the entirety of the Indian subcontinent. The Mughal Empire was marked by a period of artistic exchanges and a Central Asian and South Asian architecture synthesis, with remarkable buildings such as the Taj Mahal. At its height, the empire was the world's largest economy, worth almost 25% of global GDP, more than the entirety of Western Europe. However, this time also marked an extended period of religious persecution. Two of the religious leaders of Sikhism, Guru Arjan and Guru Tegh Bahadur were arrested under orders of the Mughal emperors, asked to convert to Islam, and executed when they refused. Religious taxes on non-Muslims called jizya were imposed. Buddhist, Hindu and Sikh temples were desecrated. However, not all Muslim rulers persecuted non-Muslims. Akbar, a Mughal ruler for example, sought religious tolerance and abolished jizya. After his death, the persecution of non-Muslims in South Asia returned. The persecution and religious violence in South Asia peaked during Aurangzeb's reign, with him issuing orders in 1669, to all his governors of provinces to "destroy with a willing hand the schools and temples of the infidels, and that they were strictly enjoined to put an entire stop to the teaching and practice of idolatrous forms of worship". In Aurangzeb's time, almost all of South Asia was claimed by the Mughal Empire. However, this claim was violently challenged in various regions of South Asia, particularly by the Sikh Guru Gobind Singh in the northwest, and by Shivaji in the Deccan regions. Maritime trading between South Asia and European merchants began after the Portuguese explorer Vasco de Gama returned to Europe. After the death of Aurangzeb and the collapse of the Mughal Empire, the region came under the rule of many small Islamic sultanates and Hindu kingdoms. British, French, Portuguese colonial interests struck treaties with these rulers, and established their trading ports. In northwest South Asia, a large region was consolidated into the Sikh Empire by Ranjit Singh. After his death, the British Empire expanded their interests till the Hindu Kush region. In the east, the Bengal region was split into Muslim East Bengal and Hindu West Bengal, by the colonial British empire, in early 1900s, a split that was reversed. However, after the World War II, at the eve of India's independence, the region was split again into East Pakistan and West Bengal. East Pakistan became Bangladesh in 1971. The Indian peninsula, and the Himalayas on the northeast, is the result of the collision of the Indian Plate with the Eurasian Plate through tectonic activity between 20 and 50 million years ago. According to Saul Cohen, early colonial era strategists treated South Asia with East Asia, but in reality the South Asia region excluding Afghanistan is a distinct geopolitical region separated from other nearby geostrategic realms, one that is geographically diverse. The region is home to a variety of geographical features, such as glaciers, rainforests, valleys, deserts, and grasslands that are typical of much larger continents. It is surrounded by three water bodies – the Bay of Bengal, the Indian Ocean and the Arabian Sea – and has acutely varied climate zones. The tip of the Indian Peninsula had the highest quality pearls. The boundaries of South Asia vary based on how the region is defined. South Asia's northern, eastern, and western boundaries vary based on definitions used, while the Indian Ocean is the southern periphery. Most of this region rests on the Indian Plate and is isolated from the rest of Asia by mountain barriers. Much of the region consists of a peninsula in south-central Asia, rather resembling a diamond which is delineated by the Himalayas on the north, the Hindu Kush in the west, and the Arakanese in the east, and which extends southward into the Indian Ocean with the Arabian Sea to the southwest and the Bay of Bengal to the southeast. According to Robert M. Cutler – a scholar of Political Science at Carleton University, the terms South Asia, Southwest Asia and Central Asia are distinct, but the confusion and disagreements have arisen due to the geopolitical movement to enlarge these regions into Greater South Asia, Greater Southwest Asia and Greater Central Asia. The frontier of Greater South Asia, states Cutler, between 2001–2006 has been geopolitically extended to eastern Iran and western Afghanistan in the west, and in the north to northeastern Iran, northern Afghanistan, and southern Uzbekistan. Most of this region is resting on the Indian Plate, the northerly portion of the Indo-Australian Plate, separated from the rest of the Eurasian Plate. The Indian Plate includes most of South Asia, forming a land mass which extends from the Himalayas into a portion of the basin under the Indian Ocean, including parts of South China and Eastern Indonesia, as well as Kunlun and Karakoram ranges, and extending up to but not including Ladakh, Kohistan, the Hindu Kush range and Balochistan. It may be noted that geophysically the Yarlung Tsangpo River in Tibet is situated at the outside of the border of the regional structure, while the Pamir Mountains in Tajikistan are situated inside that border. It was once a small continent before colliding with the Eurasian Plate about 50–55 million years ago and giving birth to the Himalayan range and the Tibetan plateau. It is the peninsular region south of the Himalayas and Kuen Lun mountain ranges and east of the Indus River and the Iranian Plateau, extending southward into the Indian Ocean between the Arabian Sea (to the southwest) and the Bay of Bengal (to the southeast). 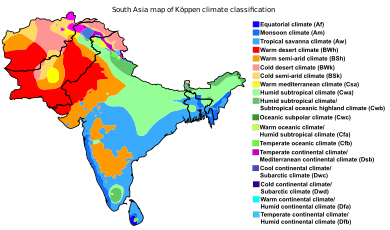 South Asia's Köppen climate classification map is based on native vegetation, temperature, precipitation and their seasonality. The climate of this vast region varies considerably from area to area from tropical monsoon in the south to temperate in the north. The variety is influenced by not only the altitude, but also by factors such as proximity to the sea coast and the seasonal impact of the monsoons. Southern parts are mostly hot in summers and receive rain during monsoon periods. The northern belt of Indo-Gangetic plains also is hot in summer, but cooler in winter. The mountainous north is colder and receives snowfall at higher altitudes of Himalayan ranges. As the Himalayas block the north-Asian bitter cold winds, the temperatures are considerably moderate in the plains down below. For most part, the climate of the region is called the Monsoon climate, which keeps the region humid during summer and dry during winter, and favours the cultivation of jute, tea, rice, and various vegetables in this region. The summer monsoon: Wind blows from southwest to most of parts of the region. It accounts for 70%–90% of the annual precipitation. The winter monsoon: Wind blows from northeast. Dominant in Sri Lanka and Maldives. The warmest period of the year precedes the monsoon season (March to mid June). In the summer the low pressures are centered over the Indus-Gangetic Plain and high wind from the Indian Ocean blows towards the center. The monsoons are second coolest season of the year because of high humidity and cloud covering. But, at the beginning of June the jetstreams vanish above the Tibetan Plateau, low pressure over the Indus Valley deepens and the Intertropical Convergence Zone (ITCZ) moves in. The change is violent. Moderately vigorous monsoon depressions form in the Bay of Bengal and make landfall from June to September. List of countries by past and future population provide 1950, 2000 and 2050 population while the year 2100 data is from the United Nations. This list includes dependent territories within their sovereign states (including uninhabited territories), but does not include claims on Antarctica. EEZ+TIA is exclusive economic zone (EEZ) plus total internal area (TIA) which includes land and internal waters. The population of South Asia is about 1.749 billion which makes it the most populated region in the world. It is socially very mixed, consisting of many language groups and religions, and social practices in one region that are vastly different from those in another. South Asia is home to some of the most populated cities in the world. Dhaka, Delhi, Mumbai and Karachi are four of the world's largest megacities. Ethno-linguistic distribution map of South Asia. There are numerous languages in South Asia. The spoken languages of the region are largely based on geography and shared across religious boundaries, but the written script is sharply divided by religious boundaries. In particular, Muslims of South Asia such as in Afghanistan and Pakistan use the Arabic alphabet and Persian Nastaliq. Till 1971, Muslim Bangladesh (then known as East Pakistan) too mandated only the Nastaliq script, but thereafter has adopted regional scripts and particularly Bengali. Non-Muslims of South Asia, and some Muslims in India, on the other hand use their traditional ancient heritage scripts such as those derived from Brahmi script for Indo-European languages and non-Brahmi scripts for Dravidian languages and others. The Nagari script has been the primus inter pares of the traditional South Asian scripts. The Devanagari script is used for over 120 South Asian languages, including Hindi, Marathi, Nepali, Pali, Konkani, Bodo, Sindhi and Maithili among other languages and dialects, making it one of the most used and adopted writing systems in the world. The Devanagari script is also used for classical Sanskrit texts. The largest spoken language in this region is Hindi, followed by Bengali, Tamil, Telugu, Marathi, Gujarati and Punjabi. In the modern era, new syncretic languages developed in the region such as Urdu that is used by Muslim community of northern south Asia (particularly Pakistan and northern states of India). The Punjabi language spans three religions: Islam, Hinduism and Sikhism. The spoken language is similar, but it is written in three scripts. The Sikh use Gurmukhi alphabet, Muslim Punjabis in Pakistan use the Nastaliq script, while Hindu Punjabis in India use the Gurmukhi or Nāgarī script. The Gurmukhi and Nagari scripts are distinct but close in their structure, but the Persian Nastaliq script is very different. English, with British spelling, is commonly used in urban areas and is a major economic lingua franca of South Asia. In 2010, South Asia had the world's largest population of Hindus, Jains and Sikhs, about 510 million Muslims, as well as over 25 million Buddhists and 35 million Christians. Hindus make up about 68 percent or about 900 million and Muslims at 31 percent or 510 million of the overall South Asia population, while Buddhists, Jains, Christians and Sikhs constitute most of the rest. The Hindus, Buddhists, Jains, Sikhs and Christians are concentrated in India, Nepal, Sri Lanka and Bhutan, while the Muslims are concentrated in Afghanistan (99%), Bangladesh (90%), Pakistan (96%) and Maldives (100%). Indian religions are the religions that originated in the India; namely Hinduism, Jainism, Buddhism and Sikhism. The Indian religions are distinct yet share terminology, concepts, goals and ideas, and from South Asia spread into East Asia and southeast Asia. Early Christianity and Islam were introduced into coastal regions of South Asia by merchants who settled among the local populations. Later Sindh, Balochistan, and parts of the Punjab region saw conquest by the Arab caliphates along with an influx of Muslims from Persia and Central Asia, which resulted in spread of both Shia and Sunni Islam in parts of northwestern region of South Asia. Subsequently, under the influence of Muslim rulers of the Islamic sultanates and the Mughal Empire, Islam spread in South Asia. About one-third of all Muslims are from South Asia. Sri Lanka Buddhism (70.19%), Hinduism (12.61%), Islam (9.71%), Christianity (7.45%). The Major Market stock exchanges in the region are Bombay Stock Exchange (BSE) with market Capitalization of $2.298 trillion (11th largest in the world), National Stock Exchange of India (NSE) with market capitalization of $2.273 trillion (12th largest in the world), Dhaka Stock Exchange (DSE) and Pakistan Stock Exchange (PSX) with market capitalization of $72 billion. Economic data is sourced from the International Monetary Fund, current as of April 2017, and is given in US dollars. According to WHO, South Asia is home to two out of the three countries in the world still affected by polio, Pakistan and Afghanistan, with 306 & 28 polio cases registered in 2014 respectively. Attempts to eradicate polio have been badly hit by opposition from militants in both countries, who say the program is cover to spy on their operations. Their attacks on immunization teams have claimed 78 lives since December 2012. According to the World Bank's 2011 report, based on 2005 ICP PPP, about 24.6% of the South Asian population falls below the international poverty line of $1.25/day. Afghanistan and Bangladesh rank the highest, with 30.6% and 43.3% of their respective populations below the poverty line. Bhutan, Maldives and Sri Lanka have the lowest number of people below the poverty line, with 2.4%, 1.5% and 4.1% respectively. India has lifted the most people in the region above the poverty line between 2008 and 2011, around 140 million. As of 2011, 21.9% of India's population lives below the poverty line, compared to 41.6% in 2005. The World Bank estimates that India is one of the highest ranking countries in the world for the number of children suffering from malnutrition. The prevalence of underweight children in India is among the highest in the world, and is nearly double that of Sub Saharan Africa with dire consequences for mobility, mortality, productivity and economic growth. According to the World Bank, 70% of the South Asian population and about 75% of South Asia's poor live in rural areas and most rely on agriculture for their livelihood according to the UN's Food and Agricultural Organisation. In 2015, approximately 281 million people in the region were malnourished. The report says that Nepal reached both the WFS target as well as MDG and is moving towards bringing down the number of undernourished people to less than 5% of the population. Bangladesh reached the MDG target with the National Food Policy framework – with only 16.5% of the population undernourished. In India, the malnourished comprise just over 15 percent of the population. While the number of malnourished people in neighborhood has shown a decline over the last 25 years, the number of under-nourished in Pakistan displays an upward trend.There were 28.7 million hungry in Pakistan in the 1990s – a number that has steadily increased to 41.3 million in 2015 with 22% of the population malnourished. Approximately 194.6 million people are undernourished in India, which accounts for the highest number of people suffering from hunger in any single country. The 2006 report stated "the low status of women in South Asian countries and their lack of nutritional knowledge are important determinants of high prevalence of underweight children in the region". Corruption and the lack of initiative on the part of the government has been one of the major problems associated with nutrition in India. Illiteracy in villages has been found to be one of the major issues that need more government attention. The report mentioned that although there has been a reduction in malnutrition due to the Green Revolution in South Asia, there is concern that South Asia has "inadequate feeding and caring practices for young children". India and Pakistan are the dominant political powers in the region. India is by far the largest country in the area covering around three-fourths the land area of the South Asian region. India has the largest population of around three times the combined population of the 6 other countries in the region. India is also the world's largest democracy India's annual defence budget for 2013–14 is $39.2 billion which is equal to the whole Pakistan's Federal budget of $39.3 billion for 2014–15. Bangladesh is a unitary state and parliamentary democracy. Bangladesh also stands out as one of the few Muslim-majority democracies. "It is a moderate and generally secular and tolerant — though sometimes this is getting stretched at the moment — alternative to violent extremism in a very troubled part of the world", said Dan Mozena, the U.S. ambassador to Bangladesh. Although Bangladesh's legal code is secular, more citizens are embracing a conservative version of Islam, with some pushing for sharia law, analysts say. Experts say that the rise in conservatism reflects the influence of foreign-financed Islamic charities and the more austere version of Islam brought home by migrant workers in Persian Gulf countries. Diplomacy among the countries of South Asia has been mainly driven by populist politics, with the centre-stage taken by India-Pakistan conflict ever since their independence in 1947, and then the creation of Bangladesh under tense circumstances in 1971. During the height of Cold war, the elite political leaders of Pakistan aligned with the US, while India played crucial role in forming the Non-Aligned Movement and while maintaining goodwill relations with the USSR. Pakistan's governance is one of the most conflicted in the region. The military rule and the unstable government in Pakistan has become a concern for the South Asian region. In Nepal, the governance has struggled to come in the side of democracy and it only showed signs in the recent past, basically in the 21st century, to support the democratic system. The political situation in Sri Lanka has been dominated by an increasingly assertive Sinhalese nationalism, and the emergence of a Tamil separatist movement under LTTE, which was suppressed in May 2009. Myanmar's politics is dominated by a military Junta, which has sidelined the democratic forces led by Aung San Suu Kyi. ^ According to the UN cartographic section website disclaimers, "DESIGNATIONS USED: The depiction and use of boundaries, geographic names and related data shown on maps and included in lists, tables, documents, and databases on this web site are not warranted to be error free nor do they necessarily imply official endorsement or acceptance by the United Nations." ^ Doniger 2010, p. 66: "Much of what we now call Hinduism may have had roots in cultures that thrived in South Asia long before the creation of textual evidence that we can decipher with any confidence. Remarkable cave paintings have been preserved from Mesolithic sites dating from c. 30,000 BCE in Bhimbetka, near present-day Bhopal, in the Vindhya Mountains in the province of Madhya Pradesh." ^ Jones & Ryan 2006, p. xvii: "Some practices of Hinduism must have originated in Neolithic times (c. 4000 BCE). The worship of certain plants and animals as sacred, for instance, could very likely have very great antiquity. The worship of goddesses, too, a part of Hinduism today, may be a feature that originated in the Neolithic." ^ Michaels: "They called themselves arya ("Aryans," literally "the hospitable," from the Vedic arya, "homey, the hospitable") but even in the Rgveda, arya denotes a cultural and linguistic boundary and not only a racial one." ^ "World Population Prospects: The 2017 Revision". ESA.UN.org (custom data acquired via website). United Nations Department of Economic and Social Affairs, Population Division. Retrieved 10 September 2017. "South Asia". The World Factbook. Central Intelligence Agency. Archived from the original on 2 April 2015. Retrieved 4 March 2015. ^ SAARC Summit. "SAARC". SAARC Summit. Archived from the original on 16 December 2013. Retrieved 17 December 2013. ^ "South Asia Regional Overview". South Asian Regional Development Gateway. Archived from the original on 21 November 2008. ^ Desai, Praful B. 2002. Cancer control efforts in the Indian subcontinent. Japanese Journal of Clinical Oncology. 32 (Supplement 1): S13-S16. "The Indian subcontinent in South Asia occupies 2.4% of the world land mass and is home to 16.5% of the world population...."
^ "Asia" > Overview Archived 1 May 2011 at the Wayback Machine. Encyclopædia Britannica. 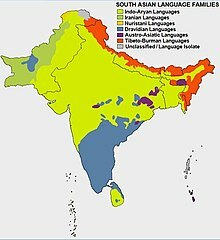 Encyclopædia Britannica Online, 2009: "The Indian subcontinent is home to a vast diversity of peoples, most of whom speak languages from the Indo-Aryan subgroup of the Indo-European family." ^ "Indian Subcontinent Archived 21 January 2012 at the Wayback Machine". Encyclopedia of Modern Asia. Macmillan Reference USA (Gale Group), 2006: "The area is divided between five major nation-states, Bangladesh, India, Nepal, Pakistan and Sri Lanka, and includes as well the two small nations of Bhutan and the Maldives Republic... The total area can be estimated at 4.4 million square kilometres, or exactly 10 percent of the land surface of Asia... In 2000, the total population was about 22 percent of the world's population and 34 percent of the population of Asia." ^ a b c d "Region: Asia-Pacific". 27 January 2011. ^ "10 Countries With the Largest Muslim Populations, 2010 and 2050". Pew Research Center's Religion & Public Life Project. 2 April 2015. Retrieved 7 February 2017. ^ a b c Ghosh, Partha Sarathy (1989). Cooperation and Conflict in South Asia. Technical Publications. pp. 4–5. ISBN 978-81-85054-68-1. ^ a b c d e f Jona Razzaque (2004). Public Interest Environmental Litigation in India, Pakistan, and Bangladesh. Kluwer Law International. pp. 3 with footnotes 1 and 2. ISBN 978-90-411-2214-8. ^ a b Michael Mann (2014). South Asia's Modern History: Thematic Perspectives. Taylor & Francis. pp. 13–15. ISBN 978-1-317-62445-5. ^ a b c Ewan W. Anderson; Liam D. Anderson (2013). An Atlas of Middle Eastern Affairs. Routledge. p. 5. ISBN 978-1-136-64862-5. , Quote: "To the east, Iran, as a Gulf state, offers a generally accepted limit to the Middle East. However, Afghanistan, also a Muslim state, is then left in isolation. It is not accepted as a part of Central Asia and it is clearly not part of the Indian subcontinent". ^ a b c "The World Bank". Archived from the original on 10 November 2015. Retrieved 5 November 2015. ^ a b c "Institute of Development Studies: Afghanistan". Archived from the original on 1 June 2017. Retrieved 28 February 2019. ^ a b c "Harvard South Asia Institute: "Afghanistan"". Archived from the original on 17 November 2015. Retrieved 5 November 2015. ^ a b c "Afghanistan Country Profile". BBC News. Archived from the original on 29 July 2018. Retrieved 21 July 2018. ^ a b c "The Brookings Institution". 30 November 2001. Archived from the original on 5 September 2015. Retrieved 5 November 2015. ^ a b c "CIA "The World Factbook"". Archived from the original on 2 April 2015. Retrieved 4 March 2015. ^ Keith Robbins (2012). Transforming the World: Global Political History since World War II. Palgrave Macmillan. p. 386. ISBN 978-1-137-29656-6. , Quote: "Some thought that Afghanistan was part of the Middle East and not South Asian at all". ^ Phillip Margulies (2008). Nuclear Nonproliferation. Infobase Publishing. p. 63. ISBN 978-1-4381-0902-2. , Quote: "Afghanistan, which lies to the northwest, is not technically a part of South Asia but is an important neighbor with close links and historical ties to Pakistan." ^ a b c McLeod, John (2002). The History of India. Greenwood Publishing Group. p. 1. ISBN 978-0-313-31459-9. ^ a b "Indian subcontinent". New Oxford Dictionary of English (ISBN 0-19-860441-6) New York: Oxford University Press, 2001; p. 929: "the part of Asia south of the Himalayas which forms a peninsula extending into the Indian Ocean, between the Arabian Sea and the Bay of Bengal. Historically forming the whole territory of greater India, the region is now divided between India, Pakistan, and Bangladesh." ^ "Indian subcontinent" > Geology and Geography Archived 20 February 2012 at the Wayback Machine. ^ The Columbia Electronic Encyclopedia, 6th ed. Columbia University Press, 2003: "region, S central Asia, comprising the countries of Pakistan, India, and Bangladesh and the Himalayan states of Nepal, and Bhutan. Sri Lanka, an island off the southeastern tip of the Indian peninsula, is often considered a part of the subcontinent." ^ Haggett, Peter (2001). Encyclopedia of World Geography (Vol. 1). Marshall Cavendish. p. 2710. ISBN 978-0-7614-7289-6. ^ Ben Cahoon. "Pakistan Princely States". Worldstatesmen.org. Archived from the original on 27 September 2007. Retrieved 23 August 2010. ^ Sarkar, Sudeshna (16 May 2007). "SAARC: Afghanistan comes in from the cold". Current Affairs – Security Watch. Swiss Federal Institute of Technology, Zürich. Archived from the original on 14 June 2011. Retrieved 6 April 2011. ^ "South Asian Organisation for Regional Cooperation (official website)". SAARC Secretariat, Kathmandu, Nepal. Retrieved 6 April 2011. ^ "SAARC Membership: India blocks China's entry for the time being". The Economic Times. 2 December 2014. Archived from the original on 18 December 2018. Retrieved 17 March 2015. ^ "South Asia". Retrieved 20 March 2015. ^ "SAFTA Protocol". Retrieved 20 March 2015. ^ "South Asia". Unicef.org. Archived from the original on 20 December 2016. Retrieved 16 December 2016. ^ "UNICEF ROSA". Unicef.org. Archived from the original on 20 December 2016. Retrieved 16 December 2016. ^ "Cambridge University: Centre of South Asian Studies". Archived from the original on 1 November 2015. Retrieved 5 November 2015. ^ "Cambridge Centre of South Asian Studies: Links to South And Southeast Asian resources". Archived from the original on 12 November 2015. Retrieved 5 November 2015. ^ "Cambridge South Asian Archive: Afghanistan" (PDF). ^ "Cambridge Centre of South Asian Studies: Library". Archived from the original on 13 November 2015. Retrieved 5 November 2015. ^ "Center for South Asia Studies: University of California, Berkeley". Southasia.berkeley.edu. Retrieved 19 August 2012. ^ "Standard Country or Area Codes for Statistical Use". Millenniumindicators.un.org. Retrieved 25 August 2012. Quote: "The assignment of countries or areas to specific groupings is for statistical convenience and does not imply any assumption regarding political or other affiliation of countries or territories by the United Nations." ^ Robert Wynn Jones (2011). Applications of Palaeontology: Techniques and Case Studies. Cambridge University Press. pp. 267–271. ISBN 978-1-139-49920-0. Boniface, Brian G.; Christopher P. Cooper (2005). Worldwide Destinations: The Geography of Travel and Tourism. Butterworth-Heinemann. ISBN 978-0-7506-5997-0. ^ Dhavendra Kumar (2012). Genomics and Health in the Developing World. Oxford University Press. p. 889. ISBN 978-0-19-537475-9. ^ Mariam Pirbhai (2009). Mythologies of Migration, Vocabularies of Indenture: Novels of the South Asian Diaspora in Africa, the Caribbean, and Asia-Pacific. University of Toronto Press. p. 14. ISBN 978-0-8020-9964-8. ^ Ronald B. Inden, Imagining India, page 51, C. Hurst & Co. Publishers, 2000, ISBN 1850655200, Quote:"It is very common today in academic and official circles to speak of the Indian subcontinent as 'South Asia', thereby distinguishing it from an 'East Asia'." ^ Sugata Bose & Ayesha Jalal, Modern South Asia, pages 3, Routledge, 2004, ISBN 0415307872, Quote:"Indian subcontinent – or South Asia – as it has come to be known in more recent and neutral parlance"
^ G. Bongard-Levin, A History of India (Progress Publishers: Moscow, 1979) p. 11. ^ Romila Thapar, A History of India (Penguin Books: New York, 1966) p. 23. ^ Romila Thapar, A History of India, p. 24. ^ Possehl 2002, p. 141–156. ^ a b c Michaels 2004, p. 33. ^ Michaels 2004, p. 32. ^ Witzel 1995, p. 3-4. ^ a b c Witzel 1995. ^ Flood 1996, p. 30-35. ^ Flood 1996, p. 33. ^ Samuel 2010, p. 41-48. ^ Stein 2010, p. 48-49. ^ Witzel 1995, p. 6. ^ Samuel 2010, p. 51-53. ^ a b Samuel 2010, p. 25. ^ a b Hiltebeitel 2007, p. 12. ^ Flood 1996, pp. 81–82. ^ Jacob Neusner (2009). World Religions in America: An Introduction. Westminster John Knox Press. ISBN 978-0-664-23320-4. ^ Gombrich 2006, p. 135. ^ Trainor 2004, pp. 103, 119. ^ Jason Neelis (2010). Early Buddhist Transmission and Trade Networks: Mobility and Exchange Within and Beyond the Northwestern Borderlands of South Asia. BRILL Academic. pp. 102–106. ISBN 978-90-04-18159-5. ^ John Guy (2014). Lost Kingdoms: Hindu-Buddhist Sculpture of Early Southeast Asia. Metropolitan Museum of Art. pp. 9–11, 14–15, 19–20. ISBN 978-1-58839-524-5. ^ Jason Neelis (2010). Early Buddhist Transmission and Trade Networks: Mobility and Exchange Within and Beyond the Northwestern Borderlands of South Asia. BRILL Academic. pp. 114–115, 144, 160–163, 170–176, 249–250. ISBN 978-90-04-18159-5. ^ Barbara Crossette (1996). So Close to Heaven: The Vanishing Buddhist Kingdoms of the Himalayas. Vintage. pp. 84–85. ISBN 978-0-679-74363-7. ^ HJ Klimkeit; R Meserve; EE Karimov; C Shackle (2000). "Religions and religious movements". In CE Boxworth; MS Asimov (eds.). History of Civilizations of Central Asia. UNESCO. pp. 79–80. ISBN 978-92-3-103654-5. ^ Samuel 2010, pp. 193–228, 339–353, specifically pp. 76–79 and 194–199. ^ John Guy; Pierre Baptiste; Lawrence Becker; Bérénice Bellina; Robert L. Brown; Federico Carò (2014). Lost Kingdoms: Hindu-Buddhist Sculpture of Early Southeast Asia. Yale University Press. pp. 10–11. ISBN 978-0-300-20437-7. ^ Michell 1977, p. 18, 40. ^ Hartmut Scharfe (2002). Handbook of Oriental Studies. BRILL Academic. pp. 144–153. ISBN 978-90-04-12556-8. ^ Craig Lockard (2007). Societies, Networks, and Transitions: Volume I: A Global History. Houghton Mifflin. p. 188. ISBN 978-0618386123. ^ Walter M. Spink (2005). Ajanta: History and Development, Volume 5: Cave by Cave. BRILL Academic. pp. 1–9, 15–16. ISBN 978-90-04-15644-9. ^ "Ellora Caves – UNESCO World Heritage Centre". Whc.unesco.org. , Quote:"Ellora, with its uninterrupted sequence of monuments dating from A.D. 600 to 1000, brings the civilization of ancient India to life. Not only is the Ellora complex a unique artistic creation and a technological exploit but, with its sanctuaries devoted to Buddhism, Hinduism and Jainism, it illustrates the spirit of tolerance that was characteristic of ancient India." ^ Lisa Owen (2012). Carving Devotion in the Jain Caves at Ellora. BRILL Academic. pp. 1–10. ISBN 978-9004206298. ^ "History in Chronological Order". Government of Pakistan. Archived from the original on 23 July 2010. Retrieved 9 January 2008. ^ David Lewis (31 October 2011). Bangladesh: Politics, Economy and Civil Society. Cambridge University Press. p. 44. ISBN 978-1-139-50257-3. In 1346 ... what became known as the Bengal Sultanate began and continued for almost two centuries. ^ Syed Ejaz Hussain (2003). The Bengal Sultanate: Politics, Economy and Coins, A.D. 1205–1576. Manohar. ISBN 978-81-7304-482-3. ^ Kulke and Rothermund, Hermann and Dietmar (2004) . A History of India. Routledge (4th edition). pp. 187–188. ISBN 978-0-415-32919-4. ^ Nilakanta Sastri, K. A. (1955) [reissued 2002]. A history of South India from prehistoric times to the fall of Vijayanagar. New Delhi: Indian Branch, Oxford University Press. pp. 216, 239–250. ISBN 978-0-19-560686-7. ^ Guptajit Pathak (2008). Assam's history and its graphics. Mittal. p. 124. ISBN 978-81-8324-251-6. ^ C. E. Bosworth (2014). New Islamic Dynasties. Edinburgh University Press. pp. 179–180. ISBN 978-0-7486-9648-2. ^ József Böröcz (10 September 2009). The European Union and Global Social Change. Routledge. p. 21. ISBN 9781135255800. Retrieved 26 June 2017. ^ Catherine Blanshard Asher (1992). Architecture of Mughal India. Cambridge University Press. pp. 1–2. ISBN 978-0-521-26728-1. ^ Lawrence E. Harrison, Peter L. Berger (2006). Developing cultures: case studies. Routledge. p. 158. ISBN 9780415952798. ^ John F. Richards (1995). The Mughal Empire. Cambridge University Press. pp. 97–101. ISBN 978-0-521-56603-2. Pashaura Singh (2006). Life and Work of Guru Arjan: History, Memory, and Biography in the Sikh Tradition. Oxford University Press. pp. 23, 217–218. ISBN 978-0-19-567921-2. ^ Chris Seiple (2013). The Routledge handbook of religion and security. New York: Routledge. p. 96. ISBN 978-0-415-66744-9. ^ Pashaura Singh and Louis Fenech (2014). The Oxford handbook of Sikh studies. Oxford, UK: Oxford University Press. pp. 236–238, 442–445. ISBN 978-0-19-969930-8. ^ Annemarie Schimmel; Burzine K. Waghmar (2004). The Empire of the Great Mughals: History, Art and Culture. Reaktion. pp. 35, 115–121. ISBN 978-1-86189-185-3. ^ Matthew White (2011). The Great Big Book of Horrible Things. W. W. Norton. p. 234. ISBN 978-0-393-08192-3. The Mughals traditionally had been tolerant of Hinduism ... Aurangzeb, however ... prohibited Hindus from riding horses or litters. He reintroduced the head tax non-Muslims had to pay. Aurangzeb relentlessly destroyed Hindu temples all across India. ^ John Bowman (2005). Columbia Chronologies of Asian History and Culture. Columbia University Press. pp. 282–284. ISBN 978-0-231-50004-3. ^ W. Owen Cole; Piara Singh Sambhi (1978). The Sikhs: Their Religious Beliefs and Practices. Routledge. pp. 36–37. ISBN 978-0-7100-8842-0. ^ Lisa Balabanlilar (2012). Imperial Identity in Mughal Empire: Memory and Dynastic Politics in Early Modern Central Asia. I.B.Tauris. pp. 97, 180–181. ISBN 978-1-84885-726-1. ^ J. S. Grewal (1990). The Sikhs of the Punjab. The New Cambridge History of India. II.3. Cambridge University Press. pp. 99, 103. ISBN 978-0-521-26884-4. In 1799, a process of unification was started by Ranjit Singh virtually to establish an empire ... Before his death in 1839 Rajit Singh's authority over all the conquered and subordinated territories between the river Satlej and the mountain ranges of Ladakh, Karakoram, Hindukush and Sulaiman was recognized. ^ Patwant Singh (2008). Empire of the Sikhs: The Life and Times of Maharaja Ranjit Singh. Peter Owen. pp. 113–124. ISBN 978-0-7206-1323-0. ^ Debjani Sengupta (2015). The Partition of Bengal: Fragile Borders and New Identities. Cambridge University Press. pp. 16–19. ISBN 978-1-316-67387-4. ^ Bashabi Fraser (2008). Bengal Partition Stories: An Unclosed Chapter. Anthem. pp. 7–16. ISBN 978-1-84331-299-4. ^ Xinru, Liu, "The Silk Road in World History" (New York: Oxford University Press, 2010), 40. ^ "Asia" > Geology and Geography Archived 23 February 2012 at the Wayback Machine. The Columbia Electronic Encyclopedia, 6th ed. Columbia University Press, 2003: "Asia can be divided into six regions, each possessing distinctive physical, cultural, economic, and political characteristics... South Asia (Afghanistan and the nations of the Indian Peninsula) is isolated from the rest of Asia by great mountain barriers." ^ "Asia" > Geologic history – Tectonic framework Archived 1 May 2011 at the Wayback Machine. Encyclopædia Britannica. Encyclopædia Britannica Online, 2009: "The paleotectonic evolution of Asia terminated some 50 million years ago as a result of the collision of the Indian Plate with Eurasia. Asia's subsequent neotectonic development has largely disrupted the continent's preexisting fabric. The first-order neotectonic units of Asia are Stable Asia, the Arabian and Indian cratons, the Alpide plate boundary zone (along which the Arabian and Indian platforms have collided with the Eurasian continental plate), and the island arcs and marginal basins." ^ Chapman, Graham P. & Baker, Kathleen M., eds. The changing geography of Asia. (ISBN 0-203-03862-2) New York: Taylor & Francis e-Library, 2002; p. 10: "This greater India is well defined in terms of topography; it is the Indian peninsula, hemmed in by the Himalayas on the north, the Hindu Khush in the west and the Arakanese in the east." ^ a b Robert M. Cutler (2007). Mehdi Amineh (ed.). The Greater Middle East in Global Politics: Social Science Perspectives on the Changing Geography of the World Politics. BRILL. pp. xv, 112. ISBN 978-90-474-2209-9. ^ a b c d "Field Listing :: Names". CIA. Retrieved 28 July 2011. ^ a b "UNGEGN List of Country Names" (PDF). United Nations Group of Experts on Geographical Names. 2007. Retrieved 28 July 2011. ^ a b c "List of countries, territories and currencies". Europa. 9 August 2011. Retrieved 10 August 2011. ^ "Field Listing :: Capital". CIA. Retrieved 3 August 2011. ^ "UNGEGN World Geographical Names". United Nations Group of Experts on Geographical Names. 29 July 2011. Retrieved 3 August 2011. ^ "Field Listing :: Area". CIA. Retrieved 7 August 2011. ^ a b "Country Comparison :: Population". CIA. July 2012. Retrieved 2 September 2012. ^ a b "World Economic Outlook (April 2017) – Nominal GDP". IMF. Retrieved 26 August 2017. ^ a b "World Economic Outlook (April 2017) – Nominal GDP per capita". IMF. Retrieved 26 August 2017. ^ "Human Development Reports". hdr.undp.org. Retrieved 26 August 2017. ^ Baten, Jörg (2016). A History of the Global Economy. From 1500 to the Present. Cambridge University Press. p. 249. ISBN 9781107507180. ^ a b c Cox, Wendell (January 2015). "Demographia World Urban Areas" (PDF). Demographia. Archived (PDF) from the original on 24 June 2013. Retrieved 26 November 2015. ^ a b Braj B. Kachru; Yamuna Kachru; S. N. Sridhar (2008). Language in South Asia. Cambridge University Press. pp. 122–127, 419–423. ISBN 978-1-139-46550-2. ^ George Cardona; Dhanesh Jain (2003). The Indo-Aryan Languages. Routledge. pp. 75–77. ISBN 978-0-415-77294-5. ^ David Templin. "Devanagari script". Omniglot. Retrieved 5 April 2015. ^ Peter T. Daniels; William Bright (1996). The World's Writing Systems. Oxford University Press. p. 395. ISBN 978-0-19-507993-7. ^ Braj B. Kachru; Yamuna Kachru; S. N. Sridhar (2008). Language in South Asia. Cambridge University Press. pp. 391–394. ISBN 978-1-139-46550-2. ^ "Region: South Asia". 27 January 2011. Retrieved 1 January 2017. ^ a b Adams, C. J., Classification of religions: Geographical Archived 14 December 2007 at the Wayback Machine, Encyclopædia Britannica, 2007. Accessed: 15 July 2010; Quote: "Indian religions, including early Buddhism, Hinduism, Jainism, and Sikhism, and sometimes also Theravāda Buddhism and the Hindu- and Buddhist-inspired religions of South and Southeast Asia". ^ Alberts, Irving, T., . D. R. M. (2013). Intercultural Exchange in Southeast Asia: History and Society in the Early Modern World (International Library of Historical Studies). I.B. Tauris. ^ Lisa Balabanlilar (2012). Imperial Identity in Mughal Empire: Memory and Dynastic Politics in Early Modern Central Asia. I.B. Tauris. pp. 1–2, 7–10. ISBN 978-1-84885-726-1. ^ Pechilis, Karen; Raj, Selva J. (1 January 2013). South Asian Religions: Tradition and Today. Routledge. ISBN 9780415448512. ^ Diplomat, Akhilesh Pillalamarri, The. "How South Asia Will Save Global Islam". The Diplomat. Retrieved 7 February 2017. ^ "CIA – The World Factbook – Afghanistan". CIA. Retrieved 27 March 2012. ^ "Bangladesh : AT A GLANCE". Banbeis.gov.bd. Archived from the original on 6 July 2011. Retrieved 23 August 2010. ^ a b "CIA – The World Factbook". CIA. Retrieved 27 March 2012. ^ "Indian Census". Censusindia.gov.in. Archived from the original on 14 May 2007. Retrieved 23 August 2010. ^ "religion". Maldives. Retrieved 23 August 2010. ^ "Maldives". Law.emory.edu. 21 February 1920. Retrieved 23 August 2010. ^ "NEPAL" (PDF). Retrieved 23 August 2010. ^ "Population by religions" (PDF). Statistics Division of the Government of Pakistan. Archived from the original (PDF) on 17 June 2006. ^ "Table 1". 13 May 2007. Archived from the original on 13 May 2007. Retrieved 23 August 2010. ^ "Welcome to WorldBank Group". World Bank. Retrieved 23 August 2010. ^ "South Asia, now the fastest-growing region in the world, could take greater advantage of cheap oil to reform energy pricing". ^ "Company Profile". Pakistan Stock Exchange. ^ "Report for Selected Countries and Subjects". www.imf.org. ^ "World Economic Outlook (April 2017) – Real GDP growth". IMF. Retrieved 26 August 2017. ^ "World Economic Outlook (April 2017) – Inflation rate, average consumer prices". IMF. Retrieved 26 August 2017. ^ a b c "UN" (PDF). ^ "The World Factbook — Central Intelligence Agency". www.cia.gov. ^ "GPEI". Archived from the original on 6 July 2015. ^ Haider, Sajjad; Khan, Shameen (31 December 2014). "Lost — The battle against polio". Dawn. ^ "Poverty & Equity Data Portal". povertydata.worldbank.org. ^ Chakravarty, Manas (13 October 2014). "The World Bank on India's poverty". Live Mint. ^ "India - Data". data.worldbank.org. ^ "Agriculture in South Asia". World Bank. ^ "India home to world's largest number of hungry people: report". Dawn. 29 May 2015. ^ Pandey, Geeta (13 October 2006). "'Hunger critical' in South Asia". BBC News. Retrieved 4 January 2010. ^ "The EU's External Relations". Europarl.europa.eu. Retrieved 23 August 2010. ^ Vikram Aditya (26 May 2014). "Foreign Policy: Seizing The Initiative And Maintaining The Momentum". The Indian Republic. Archived from the original on 6 June 2014. ^ Gautam Mukherjee (27 May 2014). "Why invitation to SAARC countries is Modi's masterstroke". Niti Central. Archived from the original on 7 June 2014. Retrieved 6 June 2014. ^ Barry Buzan (2004). The United States and the great powers: world politics in the twenty-first century. Polity. pp. 71, 99. ISBN 978-0-7456-3374-9. Retrieved 27 December 2011. ^ Hussein Solomon. "South African Foreign Policy and Middle Power Leadership". Archived from the original on 24 June 2002. Retrieved 27 December 2011. ^ "Area and Population of Countries (mid-2006 estimates)". Infoplease. Retrieved 23 August 2010. ^ "India: world's largest democracy". BBC Learning Zone Class Clips. Archived from the original on 14 January 2011. ^ "India's defence budget is one third of China: Pentagon". The Economic Times. 17 June 2014. ^ Haider, Irfan (3 June 2014). "Finance minister unveils Rs3.945tr budget for 2014-15". Dawn. ^ "The world factbook-Bangladesh". CIA. Archived from the original on 20 July 2015. Retrieved 6 June 2014. ^ Gowen, Annie. "Bangladesh's political unrest threatens economic gains, democracy". The Washington Post. Retrieved 6 June 2014. ^ e.V., Transparency International. "Corruption Perceptions Index 2016". Transparency.org. Retrieved 26 August 2017. ^ "Worldwide Governance Indicators". World Bank. 2015. Retrieved 25 August 2017. ^ "Poverty headcount ratio at national poverty lines (% of population) | Data". data.worldbank.org. Retrieved 26 August 2017. ^ "School enrollment, primary (% net) | Data". data.worldbank.org. Retrieved 26 August 2017. ^ "Gross enrolment ratio, secondary, both sexes (%) - Data". data.worldbank.org. Ramstedt, Martin (2004). Hinduism in Modern Indonesia: A Minority Religion Between Local, National, and Global Interests. New York: Routledge. ISBN 978-0700715336. Wikimedia Commons has media related to South Asia.